Are you thinking about starting a blog for your business but aren’t sure what you would post about or how often you should do it? Did you start a blog but lost steam after just a few posts, leaving your blog silent? Are you struggling to be consistent? If this is you, keep reading. Today, I am sharing four simple steps to help you get started. I want you to leave with a realistic perspective about your first business blog and all that it will require for success long term. Believe me, this article is as much for me as it is for you. Owning and maintaining a blog is much like trying to eat healthy. We all know what we’re supposed to do, but it’s so easy to get off track. For instance, I thought I was just taking two weeks off from writing during a busy spell and then BAM! It’s been over three months since I have posted. 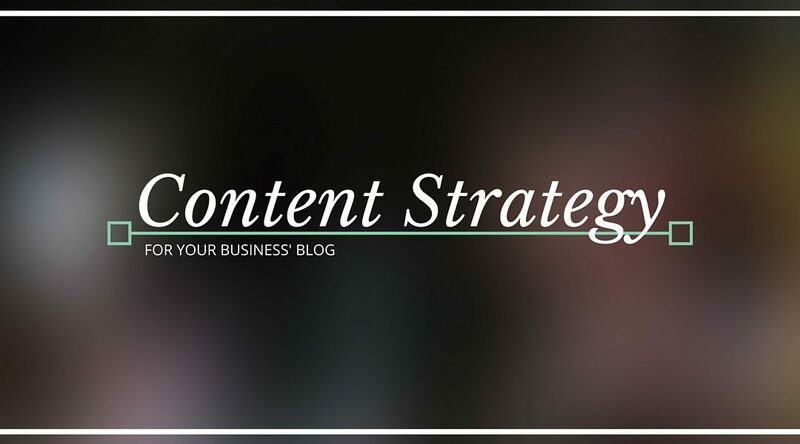 And now, here I am telling you, as much as I am myself, how to set a strategy for your business blog and keep at it! 1 – Figure out the purpose of your business blog. Before you do anything, you need to figure out who you are talking to in your blog. If you’re a B2B company, you’re not going to be talking to retail consumers. You’ll want to focus on people who have decision making power within organizations. If you’re a plumber, you might want to target both business and residential audiences. If you’re a handyman for hire or a carpenter, you might want to target do-it-yourselfers and homeowners. Whatever the audience, realize that your number one and two purposes when blogging as a business are to establish trust and provide value. You don’t do that by constantly talking about yourself. People read blogs because they get something out of it. People who come back and read a blog, week after week, do so because they feel the value and identify with the writers and the topics. Resist the urge to always talk about yourself, your products, your specials, etc. Interview one of your customers and post before and after pictures of them working with you. Tell the story of that really cool organization you were privileged to do work for. Write about the employees within your organization and what makes them special. Post your recipe for that awesome sauce that you put on top of your chicken parm sandwich. Show your readers how to make small repairs themselves. Be someone they can trust and show that you care about what they care about. To reiterate, the purpose of your blog is to first gain trust of your potential customers, and then to provide value regularly. After that, go ahead and sprinkle in things like portraying values important to your brand, such as your style, taste, quality, or superior customer service and calls to action to schedule that HVAC inspection. Figure this point out now and let it direct your blogging goals and topics. Stay true to growing the trust and value components of your blog. 2 – Set practical goals. Don’t commit to posting every day, every other day, or anywhere near that. When you are first starting out, it’s a good idea to shoot for one post every week or two. Whatever your goal is, write it down somewhere you see regularly, to help remind yourself that this is important. If you have someone on staff that you’d trust to write for your company, consider sharing the responsibility and tackling your blog as a team. Take turns posting from week to week. You can help each other be accountable and cover for each other during the busy times. Realize that you are adding a new commitment to your schedule. Don’t wait for the inspiration to strike you. Go, right now, and actually schedule 1.5 hour events in your calendar for writing at a time when you are likely to be able to focus on writing. Don’t feel like writing when that time hits? Try anyway or try some ideas on getting over writer’s block. If you aren’t making progress within 30 minutes, reschedule for the next day you can. Writing blog posts that help grow your business takes discipline for most people. Don’t be surprised if it takes you two to three hours to craft your initial posts. Depending on how in-depth you’re covering a topic, it could take longer. If you find you can’t commit that amount of time in a given week, consider breaking a topic into two posts – one this week and one the next. The good news is you’ll already know what to write about next week and you’ll have the pressure of needing to finish your thoughts! Realize there are no rules. This is your blog. If someone is really interested, they will come back. The reality is they are likely coming to your blog post well after you published it. The truth that it didn’t all get posted at the same time is completely irrelevant. If you do get inspired to write more than one post in a week, consider staging some of those to release at later times. Getting ahead of your post count goals is a great strategy when you anticipate things like vacations or extra busy periods. Keep a running list of topic ideas somewhere. I use Wunderlist for this. Programs like Evernote or simply a Google Doc will work, too. Whenever you get an idea for a post, open up the app and jot it down in a “Blog Post Ideas” list. Prior to sitting down to write your first post, you might want to brainstorm 10-12 ideas right away to start you off. Here are 11 generic ideas for your list. Post a (short) poll to ask pointed questions and invite comments. Use something like Polldaddy. Interview an employee. Have them answer 1-2 business specific questions and 2-3 personal questions. Post a picture. Respond to news coverage events relevant to your industry. Predict where things are going in your industry. Tell how you’re preparing. Keeping this list will help you when you aren’t sure what to write about. It’ll give you a healthy reservoir to draw from. After a while, having to write for a blog all the time can seem like an immense pressure. Especially for a small business owner, who may not have other employees or the right kind of employees to post on their behalf. Do not be hard on yourself. It is just a blog, not your day to day service or product. If you miss a week or two, try not to let it turn into three months. If it does turn into three months, forgive yourself. Open up your favorite editor and start typing something. Choose a smaller topic. If you consistently have a hard time making your writing goals or figure out you don’t like it, consider hiring a freelance or ghost writer. This is becoming a very common practice and not something you should be ashamed of. A freelance or ghost writer is simply a contract employee performing a service for you. Let me explain the differences between the two, to help decide what you’re more comfortable with. A ghost writer is someone that writes an article on your behalf. You post the article attached to your name, not theirs. Typically, a ghost writer will be paid more since they don’t get to keep the attribution of the article. A freelance writer is someone who you hire to write about a particular subject, usually using their name. You might give this person a quasi-title to represent their position to you, such as “Customer Success Specialist.” Many times, you can find someone that writes specifically for your niche. Sound interesting? For where to hire these folks, consider Googling for freelance writing services or try posting a job on Upwork. Like healthy eating, having a successful blog for your business is about discipline and consistent work. Sometimes, it is fun and you’re extremely proud of yourself after you make progress. Occasionally, you’re going to fall behind or get stressed and be tempted to give up. I hope that these few tips have given you some simple ground to start from and some ideas for making your blogging journey a success. Have your own tips for approaching blogging as a small business? Know a good resource for someone starting out? Leave a comment and share what has worked for you.